Villa El Carmen ((formerly Villa Carlos Fonseca) is located to the southwest of Managua, Nicaragua, in the department called Managua which includes the capital city and a large area toward the Pacific coast. Villa El Carmen is a municipality (like a county) which covers 216 square miles and contains 32,000 to 38,000 people (figures differ) . 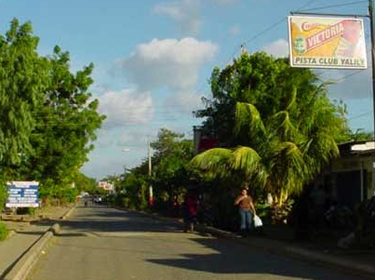 It is a rural area with various small towns; the town Villa EI Carmen is the largest with 4,000 to 7,000 residents. The Moscow Sister City Association has always dealt with the entire municipality, though emphasis has been on the town and the school in town. In the village is a medical center, with smaller health posts in the more rural areas. 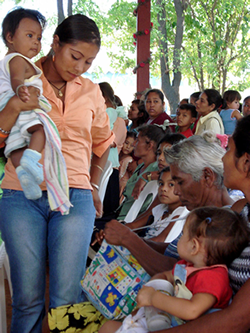 Hospital care is available in Managua . The local economy suffers from a lack of financing sources to get businesses and farm projects started. Villa EI Carmen has eleven miles of beach front where a large tourist resort is being built which may or may not improve the local economy. If the country's economy can develop, and if help continues to come from international sources, governmental and NGO, it is easy to see lots of progress being made in the next decade in all the areas noted above. And in education and women's rights. Economy: Includes mining: lime and crushed rock; cattle and dairy farming; growing of sugar cane, corn, beans, sorghum, platanos (large cousins of the banana), and various vegetables and fruits. In the town on every block there are two or more small family convenience stores selling packaged food, soft drinks, toilet articles, over-the-counter drugs, clothes, beer. There is no adequate large store around; to shop effectively you have to go to Managua. Most houses in town are connected to a central water system; most in the rural areas are not. Many houses in town have indoor plumbing; few do in the country. Each house maintains its own sewage system. Everyone in town has electricity, but in the country few are connected. An ongoing program is gradually paving the dirt roads.